Transferring historical data into EMRs takes planning and hard work. As more provider organizations adopt EMRs, the question of what to do with all those old paper charts looms as heavily as the files themselves. But if the EMR is to thrive, crucial historical data from those files must be available in the new electronic platform. 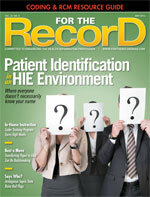 Launching an EMR solution is a project unto itself. Add to that paper charts and electronic records competing for attention, and hospitals increasingly are looking for efficient ways to transfer their old data into the new system. Getting the information from existing paper records into an EMR system can be accomplished several ways. The method that’s right for a particular organization often depends on its endgame. “If you need to make sure that all of this patient’s current medications are listed in the medications fields in the EHR, it’s as simple as hiring someone to do data entry,” says Greg Chittim, senior director at Arcadia Healthcare Solutions. On the other hand, if a hospital wants to transfer entire charts, scanning may be the answer. A large, high-speed version of a desktop scanner can be used on site. Some scanners can handle several dozen documents at a time. Including a self-contained storage enclosure in the vendor agreement means documents never leave the facility. “We can do it on site in a hospital setting, and the documents’ chain of custody is clear. Everything stays right there,” says David Winkler, director of vertical industry marketing at Ricoh Americas Corporation. External scanning service providers can be contracted, although Winkler says hospitals must be ready to add them as a bona fide business associate to meet stringent HIPAA regulations. “Every health organization has a major concern about a potential breach of protected health information,” he explains. Organizations also may opt to rent scanners and have internal staff prepare the charts and feed them into the machine. Winkler says it depends on the facility’s available resources, its budget, and whether it can devote the necessary staff hours. In other cases, a workable solution may be to partner with an off-site storage provider. “If you need some of those documents retrieved, they can drop them to you, but they also will scan them for you and e-mail them or make them available to you on a server,” explains Simon Wieczner, president and CEO of Snowbound Software. This approach may help some hospitals work through the decisions about which charts to scan as part of their EMR implementation and which to treat on an as-needed basis. It’s also a potential answer for organizations with lean internal resources. “They’ve got staff available to them to handle large amounts of document scanning if that’s what they need,” he says. Transferring existing charts into an EMR can be a significant undertaking even for a small organization. Some patients have large volumes of historical information, while others sport very little. And what about patients who haven’t visited the facility in years? Unless a hospital has the time and resources to transfer everything, figuring out what to capture from the old paper charts can be a process of its own. “There is a set of diminishing returns both in the last time a patient was in but also how deep within the record you go,” Chittim says. Deciding how far back to go and to what degree can sometimes be simplified. He suggests something akin to the 90/10 rule. “Ninety percent of the time with a patient, we’re only going to look back one or two visits,” he says. “That extra 10% of the time, if we do need to go and look at a scan of a paper record that’s attached to the electronic record, that’s OK.” In all likelihood, he adds, those discrete data lurking in the old paper chart, some of which may be many years old, won’t be needed. Perspectives on which data sets to transfer run the gamut. “It is extraordinarily important to capture the entire record,” says Scott Ferguson, CEO and founder of ChartCapture, adding that the failure to capture a complete set of data in a single system is akin to having two watches but not knowing which one—if either—has the correct time. Kohn, who contends it’s too expensive to convert back files, employs a different strategy. “If a patient comes in, pull the paper chart and review it,” she says. Individuals with a long history at the facility (ie, patients since birth) may have years of data that are relatively unnecessary. “It’s highly unlikely you’re going to want to put in stuff from that patient as a 1- or a 5-year-old,” she says, adding that chronic childhood illnesses may warrant a more comprehensive data transfer strategy. Small charts that can be captured without much effort? Include them in the EMR, she says. “But if it’s this huge monster chart and the patient was here 10, 15 years ago? You’d only want to perhaps scan or use recognition tools on the parts of the chart that are the most important,” Kohn says. In this workflow, records are updated when the patient arrives, and the rest of the paper chart is scanned and attached to the EMR. “It’s often a separate back-office function that’s either added on to someone’s work or it’s a temporary worker for a period of time that owns it,” Chittim says. However, not every facility can convert the necessary paper charts before the EMR platform’s go-live date. Even if HIM has been involved early in the process, other factors such as staffing and funding can diminish the ability to get everything accomplished prior to the transition. Many of the day-to-day uploads can be performed in-house without much disruption to employee workloads. For example, Wieczner says admissions staff can handle specific patient items such as insurance cards and driver’s licenses. Desktop scanners often can make short work of these items without significantly disrupting existing workflows. “They’ll scan all these things in and will then have it available throughout the hospital records system,” he explains. At many hospitals, the transfer and upload process likely will be continuous and separate from the actual EMR implementation. “Facilities that have had EMRs in for three, four, five years are still using vendors for scanning and capturing tools, as well as recognition tools, because they still might have a chart from the back file,” Kohn says. The decision to convert only those portions of the chart that are needed in the near term plays a factor. As frequent visitors and patients with chronic conditions return, more of the necessary paper records will be converted organically, and the need to access previous charts likely will diminish over time. How the transfer of paper records fits into the EMR implementation process varies by organization type, says Winkler, who has observed clear delineations. “In the acute care space, the larger surgical hospital settings, there are a number of clients that have taken initiatives to take patient data that’s been buried in paper charts and move it into their core electronic medical record application,” he says. On the other hand, organizations in the ambulatory market may be wrestling with the issue as they juggle historically leaner workforces and smaller budgets. Without HIM’s guidance, Winkler says there’s often a mess to clean up afterward, with revised processes, workflow changes, or an EMR implementation that doesn’t quite meet the organization’s needs. HIM also should be involved in determining where and how data will be collected during the transfer process. “Are there measures that your practice or your system or your hospital is going to be measured on, either quality or cost, that you need to make sure you get certain pieces of demographic or care data into the system so that you have an accurate picture of your care of patients?” Chittim asks. For example, it must be determined how data will be gathered for meaningful use attestation and financial obligations. “If you’re under a pay-for-performance contract, you need to make sure you’re getting all the pieces of data that are important for the quality and cost metrics that are part of that contract,” Chittim says, adding that the health information stored within the EMR must not only be accurate and complete enough to facilitate quality care but also be capable of driving future analysis of other data points. By teaching each group how information needs to be properly scanned and indexed to transfer correctly, they’ll also get a better idea of how back coding and prepping need to be done. This approach can help stave off boredom by expanding the view of how each step supports the project. “When you rotate it around and you give your internal staff a complete view from different angles, I think people are much more knowledgeable and appreciative of the work they have to go through,” Winkler says. Ferguson, who encourages hospitals to make sure individuals aren’t stuck on any one task for too long, recommends a staff of three at each scanning machine. “We recommend one person operating the scanner, literally feeding it, and then two people prepping charts,” he notes. Assigning two people to this part of the process will keep things moving smoothly, he adds. On the other hand, if a hospital can’t dedicate more than one person to the project, then that staff member should alternate between preparing charts for an hour and scanning for 30 minutes to alleviate any concentration lapses. Experts agree that instilling a team-first attitude among staff members throughout the entire transformation can increase its chances of succeeding.